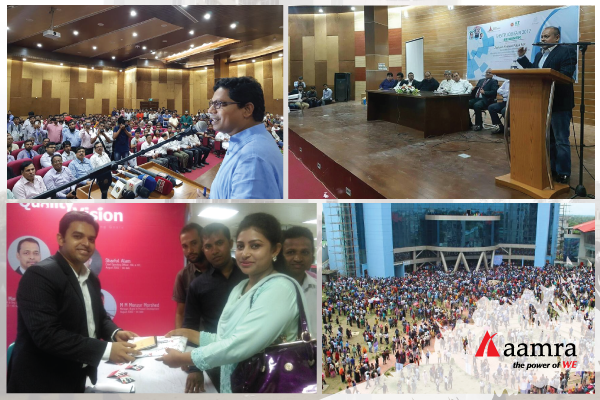 With the quest of promoting employment opportunities for the students and bringing suggestive employment in the workforce for the country, Bangladesh Hi-Tech Park Authority organized a daylong job fair on October 5, 2017.
aamra believes in the importance of human capital and ingenuity, in keeping with the tradition aamra participated in the fair organized at amphitheatre building of Sheikh Hasina Software Technology Park in Jessore. State Minister for Information Communication Technology (ICT) Division, Zunaid Ahmed Palak, graced the fair with his presence as chief guest and inaugurated the fair. He said, “The government will create employment opportunities in the IT sector for two million youths by 2021”. Ajeyo Rohitashwo ∼ Al Quazi, Group Chief People Officer of aamra companies shared a lot of informative and inspiring discourse for the youth during the session. 31 firms including 10 top ICT companies participated in the job fair and more than 20,000 young men and women attended the fair. Hosne Ara Begum, Managing Director, Bangladesh Hi-Tech Park Authority presided over the inauguration program. Prof Anwar Hossain, Vice-Chancellor of Jessore Uiversity of Science & Technology, Prof Mizanur Rahman, Principal, Jessore Govt. MM College, Md. Ashraf Uddin, Deputy Commissioner of Jessore and Mustafa Jabbar, President of Bangladesh Association of Software and Information Services (BASIS) were present among other attendees.